Ok, so in most cases I'd run without looking back if I was faced with the prospect of watching a horror movie with famous chef Mario Batali in the cast. However, the word of mouth for this particular killer chef movie has been good enough to make the prospects of viewing this much better than expected. The revenge flick that basically started it all, Straw Dogs, was released way back in 1971. Since then, such revenge-driven fare has been a near-monthly thing in our multiplexes, culminating in, yes, folks, a remake of Straw Dogs, slated to hit theaters this Fall. Given the age of this rather tired subgenre, there are plenty of conventions and clich�s in play with each and every new attempt at least a hint of greatness. One of the latest attempts at revenge-flick glory is Bitter Feast, a product of the rather interesting mind that is filmmaker Joe Maggio, the man behind the brilliant 2008 film Paper Covers Rock, and a budding talent in the indie scene. While there are flashes of similar brilliance in Bitter Feast, it too often feels like a film from a different filmmaker; one that was simply strewn together with the hopes that something would stick. MPI Home Video brings us this Bitter Feast under their Dark Sky Films label, and it�s a solid release, with some very nice supplemental features. Peter Grey (James LeGros) is a successful chef that is also the co-host of a cooking show on TV. Poor ratings as of late are leading to rumors of the show�s cancellation, leaving Peter nearly at wit�s end. Disgusted, Peter returns to his restaurant where he learns from the show�s producer (celebrity chef, himself, Mario Batali) that his show�s been cancelled, and his failing restaurant is closing, all due to a horrid review by food blogger T.J. Franks (Joshua Leonard). Franks has his own issues at home, but he�s still not ready or wanting for what happens to him next. Grey targets Franks as the reason his career and life are collapsing, so he kidnaps him, chains him up in a basement in a remote house located deep in the woods. Franks� only hope for survival is his wife, Katherine (Amy Seimetz) and a Private Investigator (Larry Fessenden), but his time may be up before they are able to find him. It�s difficult to fault the actors, as the always interesting LeGros (Living in Oblivion) does all that he can with the underwritten Peter Grey character. Joshua Leonard (The Blair Witch Project) is also solid playing the flat out horrible person that is T.J. Franks. No, there�s pretty much solid acting throughout, with much of the blame falling in Maggio�s lap. Things might have been better had Maggio gone the full-blown satire route, making his film more of a comedic take on the culinary industry, with a focus on some of the ridiculous modern cooking show that he nearly pokes fun at via the footage from the fictional show hosted by Peter Grey. If you�re a die-hard fan of Top Chef or Hell�s Kitchen, and you�re looking for something even approaching a take on those shows with Bitter Feast, you�re going to be disappointed. This DVD, however, is far from disappointing, as it�s technically impressive in both the audio and video departments. There are also some very nice extras including an alternate ending that features an interesting coda that doesn�t exist in the final feature film. 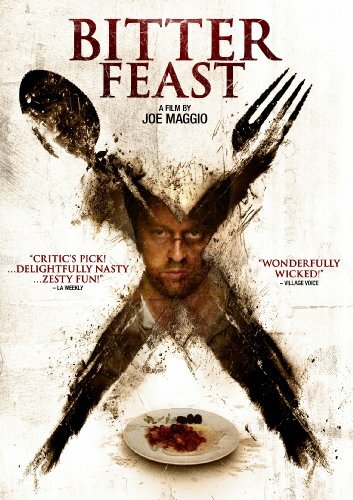 Perhaps there�s a chance that Bitter Feast could garner a cult following, despite its missteps, and if it does, it could be in large part, due to this impressive DVD release.